I need to make a correction--I misspoke. I referred to "theogenesis" as the concept that humans can become gods. The correct term is actually "theosis." Isn't it odd that I chose BYU just for the reasons she didn't. After growing up in So California, I wanted the BYU experience so that I could revel in being "good" without fighting the constant battles of being continually harassed by most of the kids I knew and could dress in a manner I found comfortable without constantly being called a prude. Jenni, this was so, so interesting. I have a weird question. So, you say that your husband is totally on board, what about your kids? I'm assuming they're pretty young, but what about when they get older? Do you think they'll be ostracized by other LDS? I mean, how do you think it will affect them? Like in the future, when one of your sons is dating someone, if he was dating one of my kids, I think I'd be pretty edgy about him being "pagan." Do you know what I mean? @ Anonymous, I know what you mean. I went to a church school for the same reason; it was somewhere where I didn't have to push back, I could just live. Please, oh please, post a link to the recipe for the resurrection rolls! Those sound like a lot of fun. My kids are 11, 4, and 1, so yes they are quite young. We haven't talked with them about our holidays being 'pagan' per se, they are just holidays we celebrate. Some of the sabbats lean to the secular (like national holidays or birthdays do)--in those cases we talk about celebrating the seasons and cycles of time. 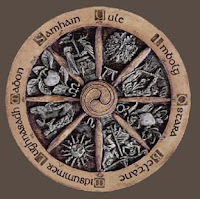 Some of the sabbats lean toward the sacred (like what I mentioned about Winter Solstice/Yule being the birth of the sun/Son, or also Samhain is a time for remembering/respecting death, and also remembering our ancestors)--so in those cases we talk about those things. I don't think my sons would think to refer to themselves as pagans really. We're mormons who have integrated some pagan holidays, you know? Not so different from, say, integrating some Jewish holidays, or celebrating Chinese New Year, or Mardi Gras! And most people have integrated pagan holidays already (at least, if you put up a christmas tree and have eggs at easter then you have!) We're just calling things by their original (pagan) names. Thank you for showing, once again on Daughters of Mormonism, that Mormonism is not Christian. And I would caution you that this syncretistic approach you seem to favor will only lead to utter mental confusion as they embody completely conflicting ideas of reality. That seems a very odd reaction, Anonymous. Christianity is focused in the person of Jesus Christ, and Jenni B expressed her belief in him quite clearly. Language is imperfect and "Christian" can mean a variety of things, but in my opinion, if someone who believes in and loves and testifies of Christ doesn't count as Christian, then maybe the expectations attached to that word have gotten a little bonkers. Even if Jenni's beliefs don't match your ideas of Christianity, that doesn't serve as proof that Mormonism isn't Christian, since Jenni is an individual and not a container for all that is Mormonism. Anyhow, you say that Jenni's favoring a syncretistic approach to "completely conflicting ideas of reality." Which ideas are these - Mormonism and Christianity, or Mormonism and Paganism? How are they in complete conflict? Anonymous, this podcast is not trying to define Mormon doctrine or policy; it is trying to reflect ideas and experience. Jenni's experience is not only a valid expression of her practice of Mormonism, but enriching to those who want to explore the variety of women's lives within Mormonism. If you would like to discuss her story, please do so. If not, please refrain from commenting. Besides being condescending, cautioning and passing judgement are not appropriate responses for commenting on this podcast (please see the comment policy). hey, jenni. i don't know if you were nervous about sharing your story or not, but i think you are brave. and i'm really glad you told your story. i have a lot of problems with seeing sexuality as good, and you talking about the balanced deity and how the pagan stuff had helped you out with seeing sexuality in a more complex way, it really gave me something to think about. i really like the idea of how there are 3(?) different festivals about different aspects of sexuality. i would really like to know more about this. Sara and Sybil responded with pretty much what I would have wanted to say to the anonymous commenter of 6/16. I'm sorry you feel so limited by your definition of Christianity. In the Bible, Christ spends a lot of time teaching guiding principles, but very little time being nit-picky about specific rules. That is why there is so much diversity among Christianity--many denominations can be legitimately following Christ while still having substantial differences between themselves. Man looks on the outward appearance, but the Lord looks on the heart. I think that's the only way to really identify whether someone is Christian (or Mormon, or anything else). I didn't know much about paganism before listening, aside from the fact that many of our holiday traditions are rooted in paganism. It was very interesting, and I'm glad you're openly talking about these things, helping to make it less of a taboo. I always thought it was interesting that so many people would have no problem discounting paganism, when most of them also practice it in some way. I've been trying to integrate celebrations of the solstices, etc into my daily life, especially since finding your blog Jenni. Thanks so much for writing and for doing this podcast. I absolutely loved the quote from Tolkien, I couldn't agree more! Jenni, this might be too personal, but are you ever afraid to even consider getting pregnant because you don't want to miscarry again? There were times when I feared pregnancy because I feared miscarriage. After my second miscarriage, I tried to make a deal with God to not let me get pregnant again unless I would carry to term. And then I got pregnant again, and miscarried again, before I got pregnant with my son. I don't fear miscarriage anymore. Perhaps it's because I have been through it so many times. (4 for certain, but based on my charting I've had 3 others that were very early--just made me a day or two 'late' but I had early symptoms showing on my charts). I think it's more than that though. I think it's that I realized that there was nothing to be gained by fearing. There's a line from a movie ("Strictly Ballroom") that says "a life lived in fear is a life half-lived" and I really believe that. The apostles have told us that fear is the opposite of faith--that faith casts out fear. Part of my learning to "let go and let God" is giving up my fear in exchange for faith. My two full-term babies were born at 39 and 40 wks respectively. With each of them, I spent the first 25ish weeks wondering if I was going to get to keep this baby. (By 25 weeks I knew that medical science could probably save them if they came at that point...) The moments when they were actually born are two of the highest points of my life. Yes, I experienced a certain amount of fear every day of every pregnancy, wondering whether it would bring me a child or another heartbreak. I've gotten some of each. But it's not the kind of fear that keeps me from going forward with my life. It's more like the fear of missing out on an opportunity. Sure, I might miscarry (and boy will that be hard), but I also might get to have the miracle of a baby in my life (and boy I don't want to miss out on that chance). I got an IUD a few months ago. As I mentioned on the podcast, we're currently on an indefinite pause with having kids, and don't know whether we'll try for another one or two in a few years, or whether this pause will turn into a full stop. I can honestly say that we'd spent several months talking about the decision, and yet it wasn't until several weeks after it was done that I had the realization that no more pregnancies also means no more miscarriages. In other words, I simply don't think about miscarriage in a future tense. It is very much a part of my past, and may enter my present again...but I don't think about it in the future. What will be will be, and if that includes another miscarriage then I will deal with it then. But for now I live in the present. I think it's nice that you've incorporated festivals that celebrate nature and its cycles into your spiritual outlook, but I think you have to be careful not to insist too strongly that paganism is totally in correlation with the LDS version of 'the gospel'. This struck me most when you mentioned Beltane. Don't get me wrong, I'm no longer Mormon, so I really don't find anything else you might believe to be offensive in any way, but what you've explained was dispelling inaccurate ideas that people might have had about your own version of paganism, but those understandings are not necessarily inaccurate understandings of paganism in general and the way pagan festivals are/were celebrated by other (or ancient) pagans. I think it's awesome though, that the natural celebration of sexuality has helped you embrace that part of yourself. It really is a healthier, more balanced view of sexuality that I think is very much in line with LDS doctrine, but not necessarily LDS culture and practice..